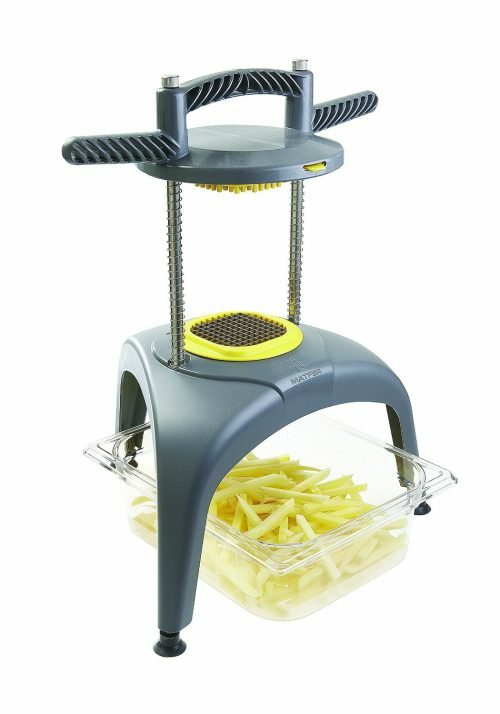 If you’re a home cook looking to make professional looking French fries, consider investing in a cutter designed to give you perfect, even pieces for frying, every time. We’ve done research on the best French fry cutters on the market – what we found are great for home or commercial use. Cook like a professional with one of the top 10 French fry cutters of 2018. This French fry cutter from VIVO is a workhorse. The durable body is constructed from cast iron, guaranteeing longevity. 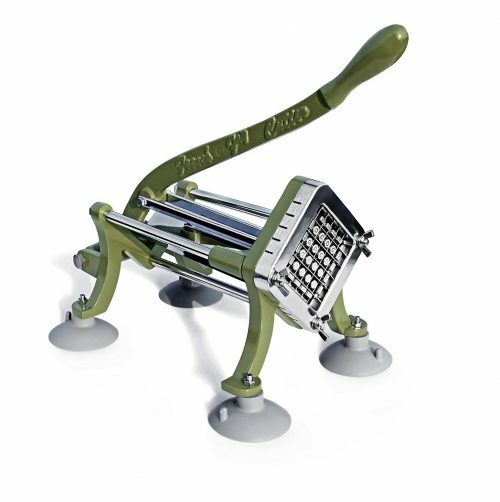 The feet are suction cups that keep the potato cutter in place, giving you a sure grip and a safe cutting space. The cutter itself is a sharp steel grid designed for easy cutting and a precise ½-inch square cut, ensuring you’ll have perfect French fries. You have the ability to cut more than just potatoes, and the suction cup feet are removable so you can mount the unit on a wall. 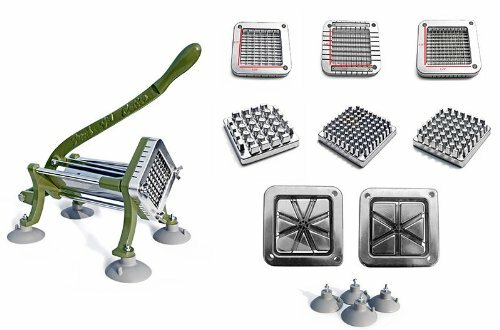 The TMS vegetable cutter is amazingly versatile, and perfect for home or commercial use. Your cutter includes four interchangeable blades that evenly cut thick, thins, shoestring, and wedge slices. Never worry about inconsistent cutting again and know that your high-quality steel blades are rust proof and very easy to clean. The unit can mount securely on a table or wall, and the cutter features an extra-long handle that makes cutting easier and more efficient. 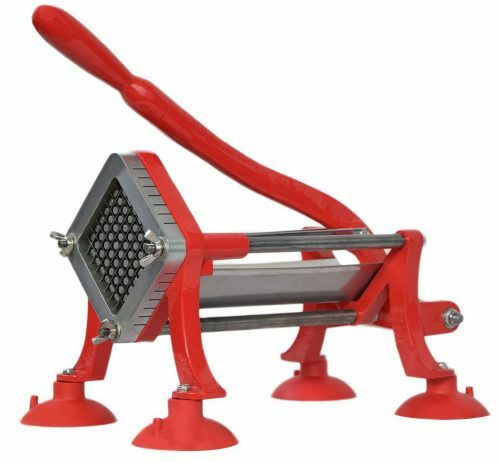 Matfer Bourgeat’s French fry cutter takes up a minimal amount of counter space, as it operates by cutting from the top down – simply place a container underneath the cutter. The cutter gives you perfect 1/3-inch square-cut fries. Tempered steel makes the cutting blade efficient and strong, and the unit is industrial dishwasher safe. This particular cutter (well, multiple cutters) was responsible for the Guinness World Record of most fries cut in a single day (13,723 pounds)! You get an amazing bundle when you purchase this cutter. The unit is commercial grade, and the heavy cast iron body is coated with a rustproof powder. The included blade functions are the ¼-inch, 3/8-inch, ½-inch, 6 wedge, and 8 wedge. The cast iron body is die cast, and the rod and blades are commercial-grade stainless steel. As an added convenience, the suction cup feet are detachable for easy cleaning and storage when not in use. 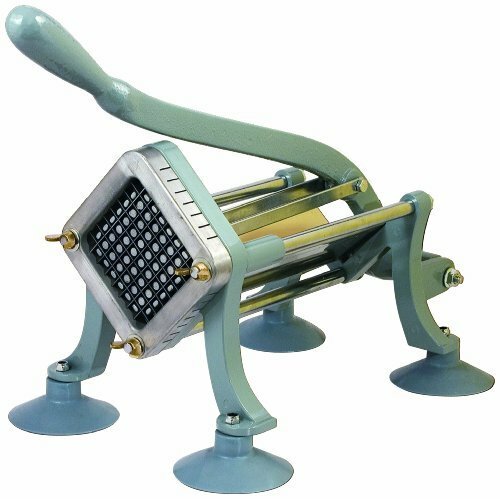 Although labeled for commercial use, this potato cutter is also perfect for home use. This French fry cutter from Nemco is constructed of a durable aluminum, and has an ergonomic design; the handle pulls easily to make perfect, consistent cuts. Due to its construction, the unit is much lighter in weight than other comparable models, making this tool easy to operate. The push plate and blade removes easily for cleaning, and you can purchase different blade sizes for variation. 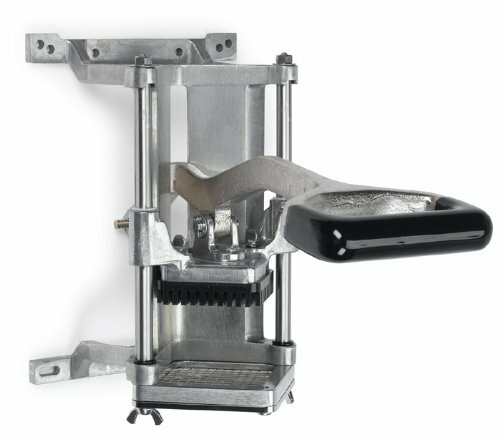 The tool can cut not only regular potatoes, but sweet potatoes and other vegetables as well. The unit mounts to either the wall or tabletop for stability. 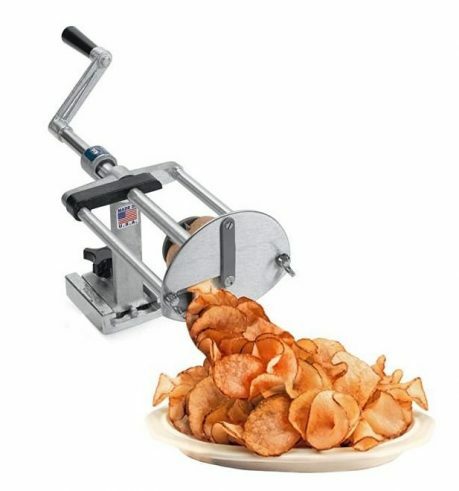 Get summer festival-style fries with this high-quality ribbon potato cutter from trusted manufacturer Nemco. The ribbon cutter makes easy, super thin spirals that make for a fun fried potato. The stainless steel body disassembles easily for cleaning, and the device can mount directly to a table. Whether you’re looking for a cutter for home or commercial use, you get quality and reliable performance from this tool. You’ll be getting a durable, long lasting French fry cutter at a great value with this tool from Update International. The body is constructed of heavy-duty cast iron, and the trough is made of stainless steel. The handle is designed to make it easier to push by applying even pressure. Although the cutter is equipped to use suction cups on the feet, they must be purchased separately. 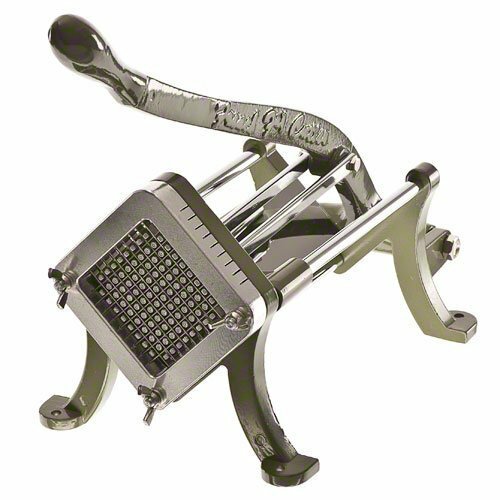 With this French fry cutter, you’ll have restaurant-style home fries in no time! 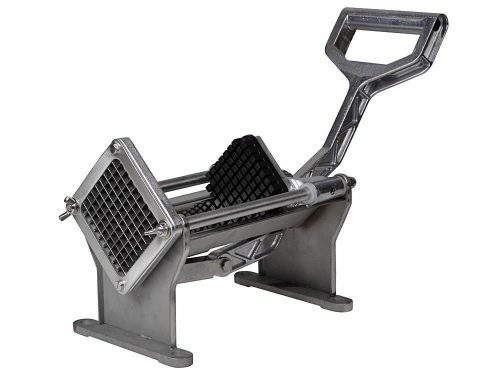 The Weston French fry cutter provides consistently even fries, and can accommodate potatoes up to 6 inches. 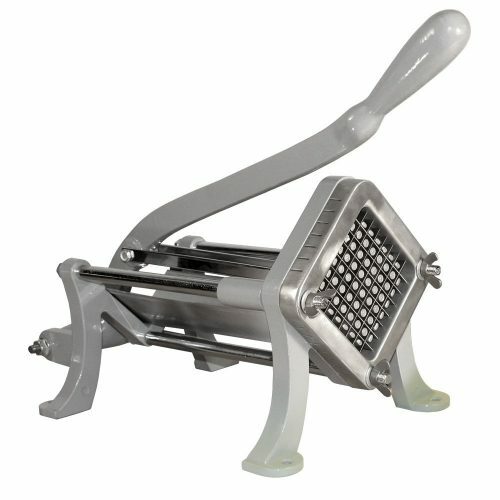 The cutter produces perfectly but fries at a home fry style 3/8”. You’ll get a fantastic deal on this cutter, as it includes suctioned feet and can be mounted to any flat surface. A cast iron and stainless steel body makes this a durable, long-lasting cutter. New Star Foodservice created this efficient French fry cutting tool. The unit is great for both home and professional use, and it’s a great value, given its quality construction and materials. The body is powder coated cast iron with a stainless steel rod; its avocado green hue adds a unique touch to any kitchen. There are four suctioned feet, and the unit can be wall or table mounted. It comes with a ½-inch cutting blade, but you can acquire other sizes separately. The all-metal construction on this cutter makes it reliable for long-term use. You have the option of permanently mounting the cutter or using the suction feet. You’ll get two sizes of cutting plates: 3/8” and ½”. You can even use this high-quality product to cut sweet potatoes. This durable cutter comes in a pleasant shade of blue, adding a nice touch of color to your kitchen.